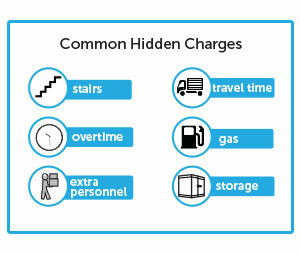 Moving Guru » Moving Guide » How Much Do Moving Companies Charge? Want to get a good deal on your move? In order to get a good moving price, you need to know what a good moving price is. Moving companies charge their customers in many different ways, leading to a wide variety of prices. This can be confusing for many customers. Fortunately, by understanding the different ways moving companies charge, and by getting some free moving quotes from us, you can have a really good idea of what a good price is… and what a bad price is. By-the-Hour Moves – Movers often charge by the hour. Sometimes it will be for a group of movingmen, rates usually falling somewhere between $80 and $150 an hour, and sometimes it will be per movingman (ex. $30 an hour for each three men). By-the-Pound Moves – Moving companies that charge by the pound will calculate the rate once they have all your stuff in their truck (or moving pod). To be safe, you can figure an average room has about 1,500 pounds of stuff in it. If it has little furniture, then closer to 1,000; if it has a lot, then closer to 2,500. Flat-Rate Moves – Flat-rate moving companies, or just companies that offer flat rates, will give you a set price for the entire move. Flat rates may be good or bad deals, depending on how difficult your move is. Stairs – Some moving companies will charge extra for troublesome issues, like stairs or parking. Overtime – What if your move takes longer than expected? Some moving companies will charge extra for that. Extra Personnel – If a moving company brings an extra mover for the job, they may bill you for it. Gas – So can gas costs. Storage – If the company has to hold onto your stuff for a day or two, you might get charged for it. Get free moving quotes to help identify good moving prices. How Much Do Movers Charge?